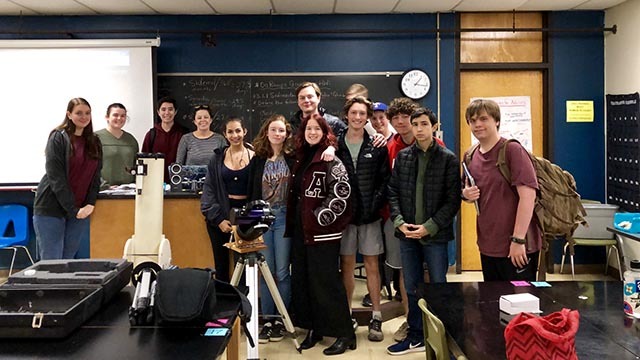 The Austin High Astronomy Club now has four working telescopes, thanks to the donations and efforts off Prof. Phil Schmidt, the Austin Astronomical Society, Terry Phillips, and Joseph Macry. The club will be give star parties with these that will give hundreds of students the opportunity to see the universe through a telescope. Today I delivered a tripod and wedge for the last telescope and gave an introduction to different kids of telescope mounts, setup procedures, and their relation to celestial coordinates. Around 250 students will take Astronomy classes at Austin High this year. The lead astronomy teacher, Elise Gonzalez, is the club advisor. She plan to train a core of students in the club in the setup and use of the telescopes so that they can lead star parties.